The Stationmasters Hostel, Stromeferry, was a new venue for the EMC and it turned out to provide very good accommodation in a lovely location beside the slipway of the former ferry. The resident otter proved to be an elusive character, but the cuckoo made its presence known from the neighbouring woods. No doubt the Club, or individual Club members wanting somewhere to stay in the Loch Carron area, will be visiting the hostel again. Saturday dawned with everyone's enthusiasm dampened by low cloud, rain, and a poor forecast - in fact some members were still mincing around in their pyjamas when the first group of hill-walkers returned in the early afternoon. Claire H and Julie were perhaps the most adventurous with an epic mountain bike circuit of Applecross. Nigel and Chris also headed for Applecross, intent on some Graham-bagging, but thought better of that plan due to drenching rain falling when they arrived at the start of the walk: Plan B came into immediate effect - a convivial lunch followed by an early return to the Hostel. 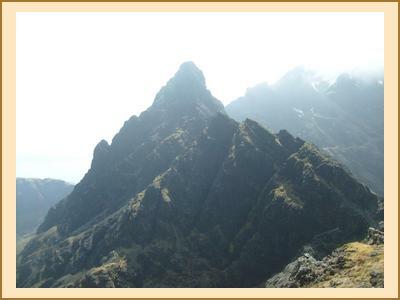 Fiona M, Colin, Guillermo and Ian climbed Sgurr an Airgid, the Corbett to the north of Morvich. Kenny, Alison C, Martin and Anne enjoyed a walk to Loch an Iasaich from the Attadale Gardens car park while Alison F, Kate, Fiona C and Jane did a circular walk around Beinn Liath Mhor from Achnashellach. Eventually the pyjama gang set off for some rock-pooling at Plockton but, due to a grave navigational error which inadvertently led them into a local hostelry, they were quite late getting back. The weather on Sunday looked more promising, and in fact it turned out to be a reasonable day. Ian and Claire H climbed Meall a' Chrasgaidh, Sgurr na Clach Geala and Sgurr na Each (central Fannaichs) from Loch a' Bhraoin in mostly good weather, although cloud and unstable cornices on Sgurr na Clach Geala required careful attention. Nigel, Chris, Colin and Anne C did Carn Breac and Beinn na Feusaige (Grahams N of Glen Carron). Alison F, Kate and Fiona C climbed A' Ghlas-bheinn while Kenny, Alison C, Guillermo, Martin, Jane, Clare A, Jane and Fiona M undertook a mass assault of Sgurr na Ceannaichean and Moruisg. 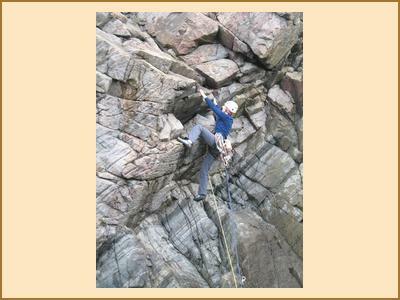 Kenny and Alison's hopes of some sport climbing at Moy were wrecked by the inability of some clown to send a text message about the weather as they passed through Garve - the nameless individual 'completely messed up' as Kenny put it. Many members stayed over until the Monday. Claire H, Clare A, Katrina and Ian enjoyed a trip to Raasay. Their objective of Dun Caan was not achieved due to a combination of a late start, an enjoyable lunch in the Hotel, and nature-watching in the beautiful deciduous woodlands along the coast. Chris did Beinn Loinne, a Corbett N of Loch Cluanie. Martin, Kenny and Alison climbed Sgurr a' Gharaidh, a Graham on the N side of Loch Carron. Several members had arranged to stay in the area between the Stromeferry and Glenbrittle meets with the hope of back packs into Fisherfield and Mullardoch, but a poor forecast combined with the rivers being in spate put paid to that. Kenny, Alison C and Nigel headed off initially to Evanton, then up to Scourie where they were joined by Fiona M to do some rock climbing and remote Graham bagging together with a trip to Handa Island. Ian, Claire H, Chris and Martin camped at Morvich and Skye, doing a variety of walks in Glen Shiel and Skye including an epic day on the South Kintail Ridge (Chris), the Clach Glas/Blaven traverse (Martin), The Cheesecake and Lurg Mhor (Claire H) and Am Basteir (Claire H and Ian). Martin was fortunate enough to see a sea eagle at Staffin. Fiona C headed for Beauly with the plan to do some cycling around Cannich, while Clare A and Katrina headed north for some more Fannaich bagging together with a walk into the Strathfarrar hills. Weather-wise this meet did not compare with the equivalent early May 2011 Plockton/Gairloch meet, with some of the more adventurous plans having to be left for another day. However everyone made the best of what the conditions permitted, gaining some consolation from the fact that the cold temperatures made the whole experience midge-free (something not to be discounted) so, all in all, it has to go down as a successful meet.